The interior of our new house has been a mystery other than bits and pieces in photos here and there. A long time ago I promised I would share my ’befores and durings’ because I am in no shape to call much of anything in this house a true ‘AFTER’ unveiling. First up- Our guest bathroom! The closest room to actually being labeled an ‘after’. 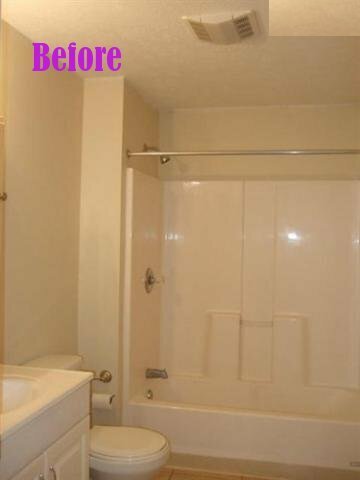 The before is a terrifying beige mess. Now I think all I’m missing is a possible shelf for more candles and dodads and some new guest towels. 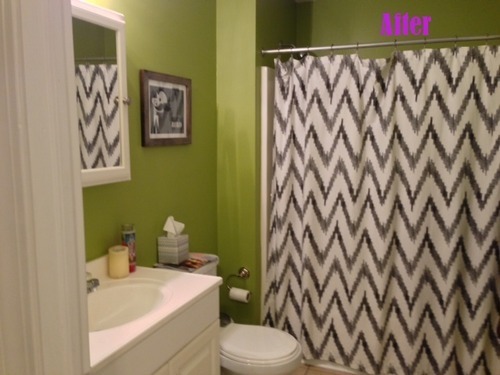 A West Elm Chevron shower curtain, Grey Cardigan framed print for JPC, and some Sherwin Williams paint can work wonders. The hard part about buying our first house right at the beginning of Summer is that you’re pulled in so many directions; you want to enjoy the outdoors and spruce up your lawn, patio set, flower beds, etc… the list is endless! So it really took us awhile to get busy inside. With Winter well on it’s way in Ohio we will hopefully get much more accomplished INSIDE! What do you think of the bathroom? Anything else I should add or change? Previous Post Stuff That Makes Me Squeal!